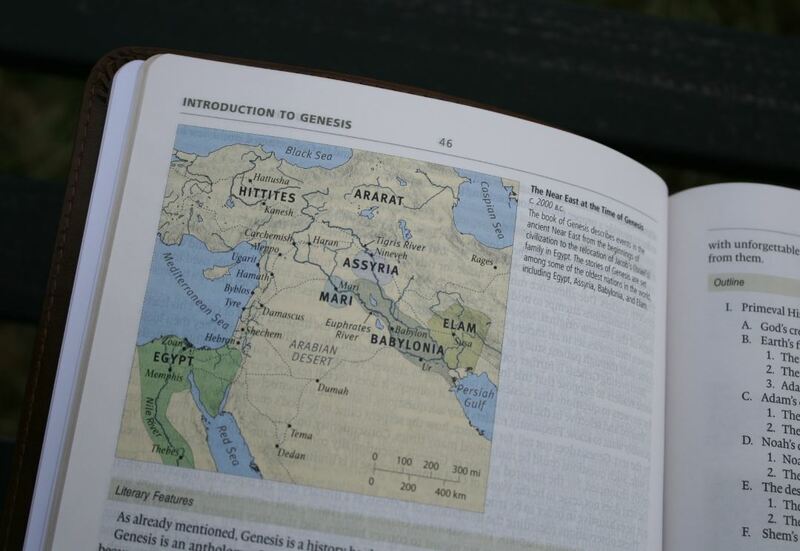 Crossway’s ESV Study Bible has been one of the most popular study Bibles on the market since it released in 2008. It’s easy to see why with its vast amount of features that include 20,000 notes and 50 articles. 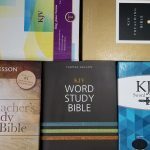 It’s basically a full library of Bible study materials. 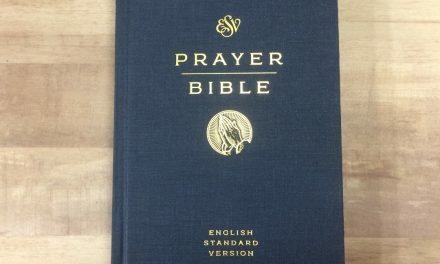 I’ve previously reviewed the regular edition. In this review, I take a look at the personal size edition and note some of the differences between the two. 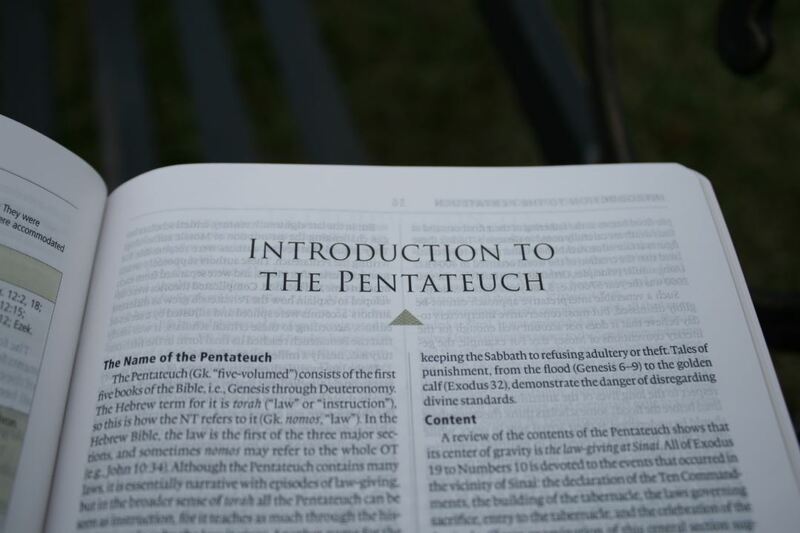 The doctrinal position follows Reformed Theology. 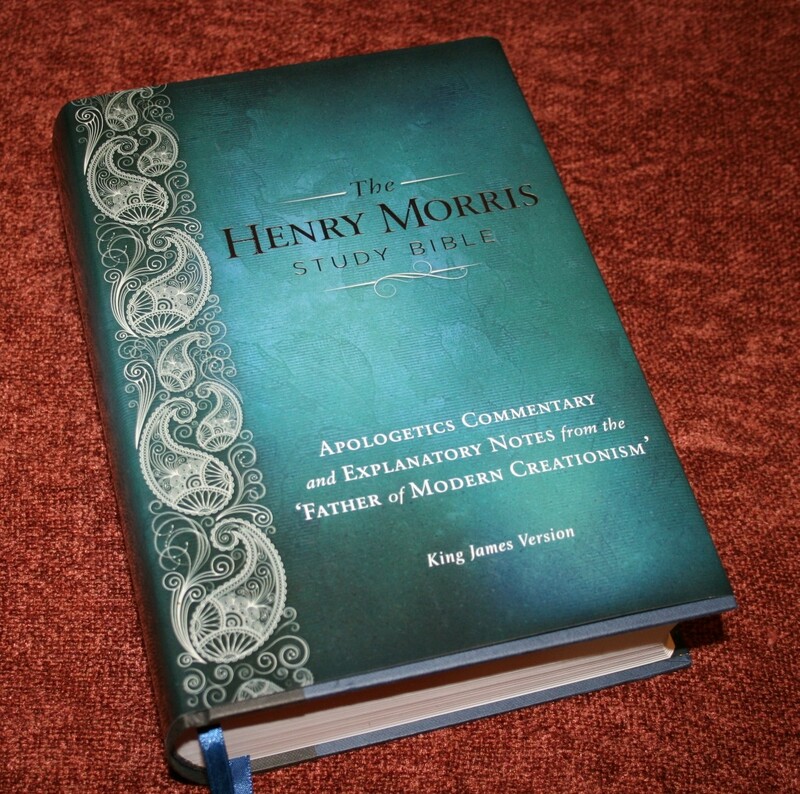 My review copy includes the 2011 edition of the ESV. This edition is TruTone Brown. It has a nice color variation through the brown that gives it some color texture and looks nice. There’s nothing printed on the front. 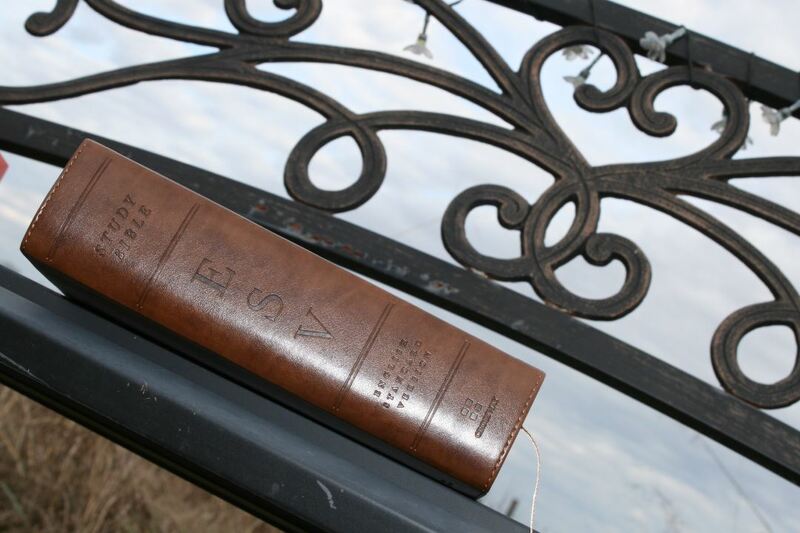 The spine has Study Bible, ESV, English Standard Version, Crossway, and four spine ridges debossed into the cover. The outer perimeter is stitched. 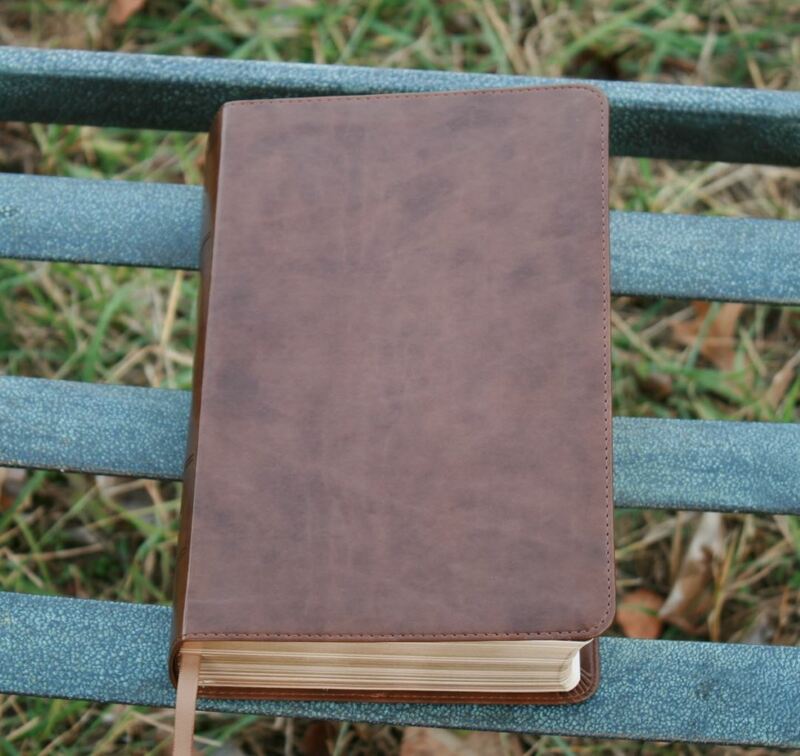 The liner is a thick vinyl/paper that is also brown to match the cover. The binding is Smyth sewn. It has no problem lying open. 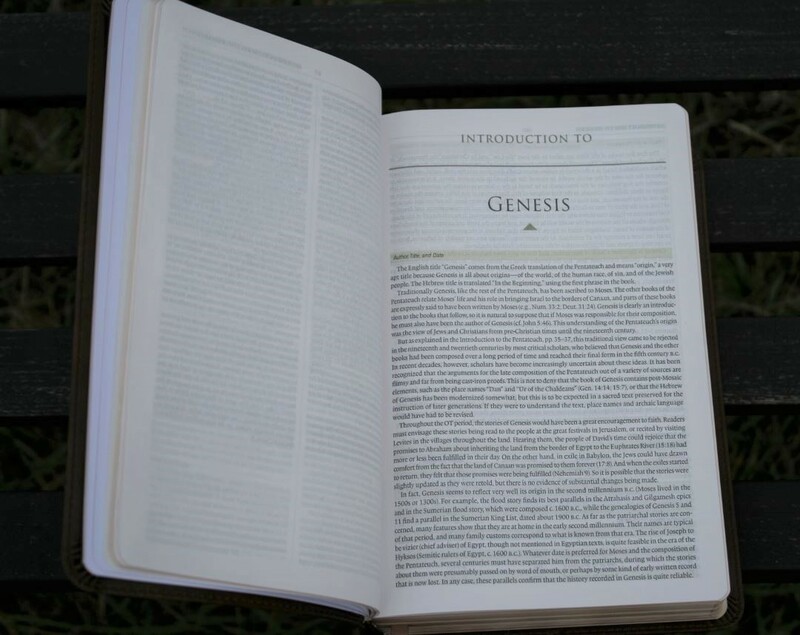 I never had to fight to keep the Bible open for reading or study. 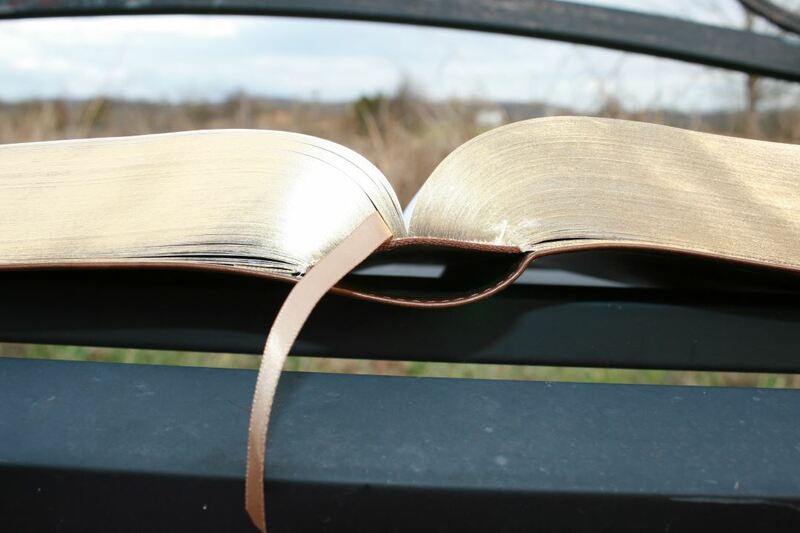 The ribbon is a lighter brown color than the cover and fits within the color and size nicely. Even in personal size, this feels like a fairly large Bible. It isn’t so large that I wouldn’t carry it around. 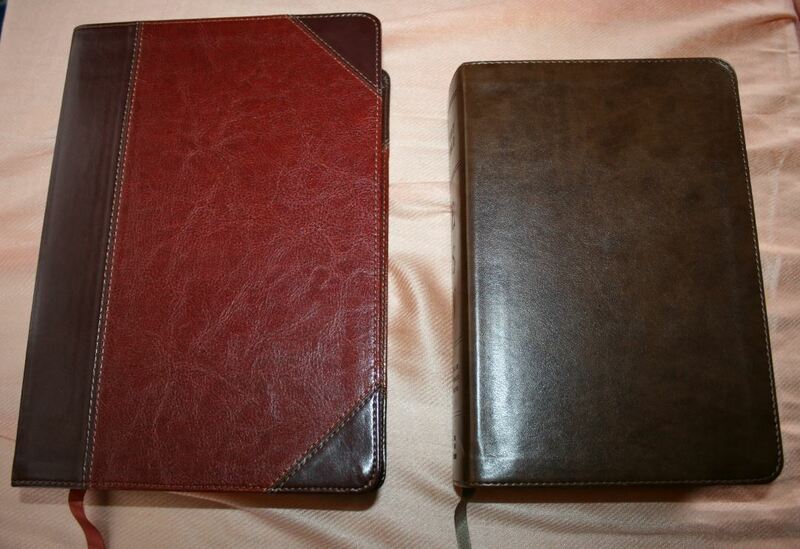 If I needed to take a study Bible with me this one is a great choice. I actually like this size better than the regular edition and I’ve found that I use this one far more. Regular size on the left, personal size on the right. The paper is 28.5 GSM Tervakoski Thincoat Plus. It has an average opacity. There is some show-through, but it’s not bad. It isn’t noticeable where the lines match on both sides of the page. Where the lines don’t match it can be more difficult to read. It has an eggshell color that has a good contrast that improves reading. It doesn’t have a glare under direct light. The text is presented in single-column paragraph format. 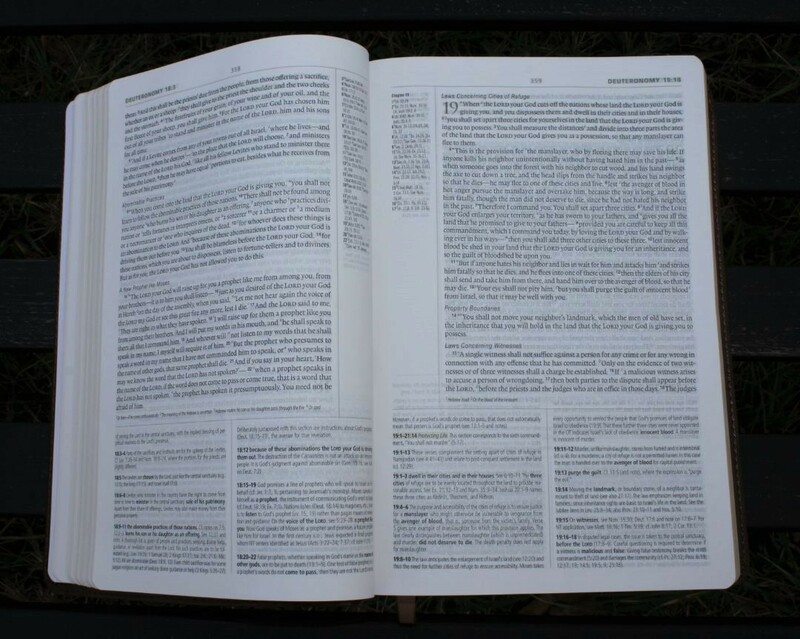 References are placed in the inner margins and translation notes are placed under the text. 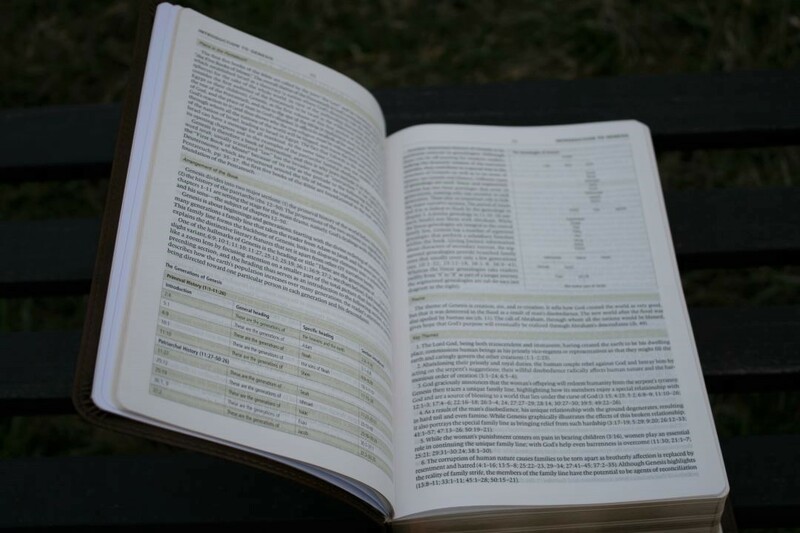 Commentary notes are in double-column format and are placed under the translation notes, taking up a large portion of the bottom of each page. 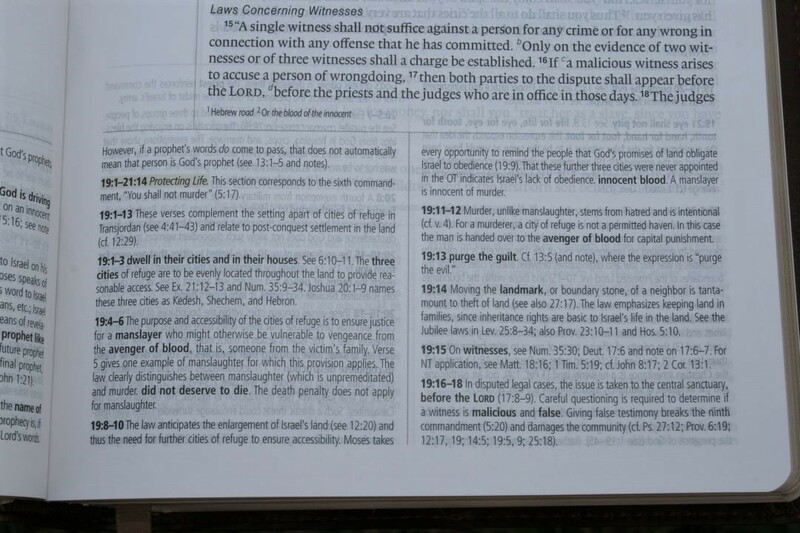 The notes also include the portion of text they correspond to in bold. 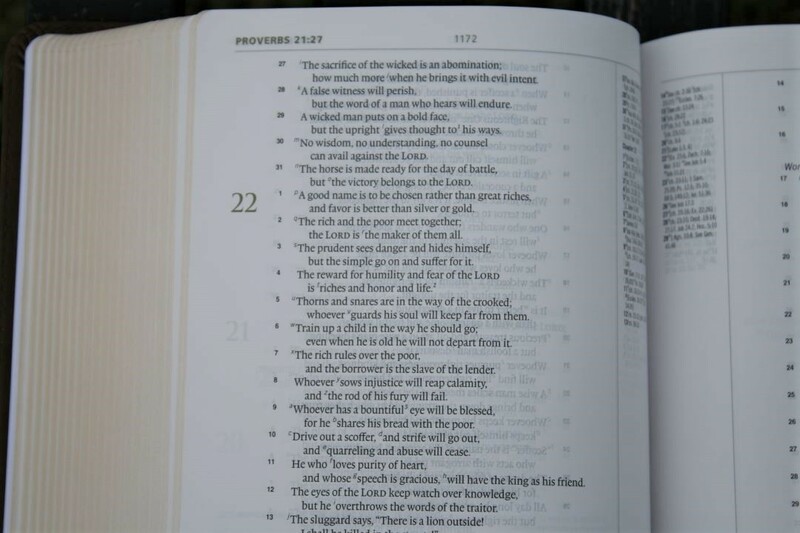 The header includes the book name, chapter, and verse numbers in the outer column and page numbers in the center. The main font is Lexicon 7.7 black letter. The print is just the right amount of darkness and is very consistent. It has a good amount of leading to make the text readable even at the smaller font size. 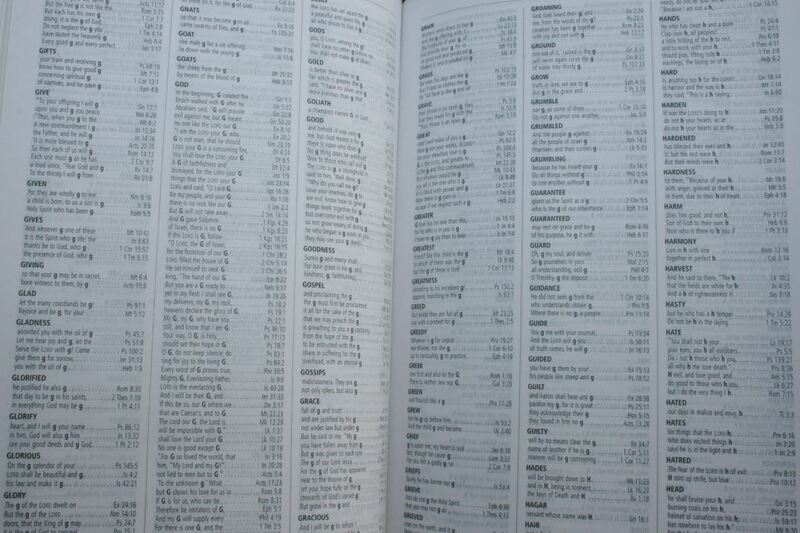 The columns are 3.68” wide with 90 characters across, with around 16-20 words per line. This makes room for perfect poetic settings. 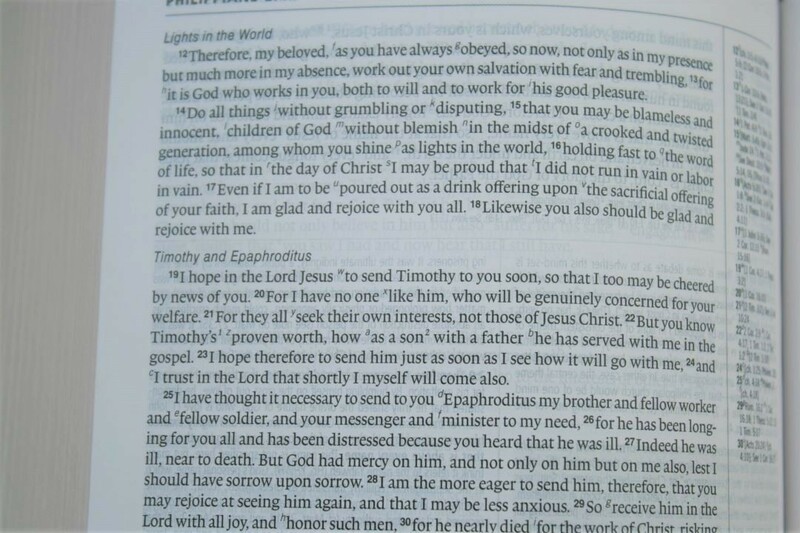 Normally that would seem like too many words on a line to me, but this Bible makes it work. Headings are printed in italics and blend in well. I find them easy to ignore while reading, but helpful if I want to scan the page for something specific. The notes are around 6.3-point. 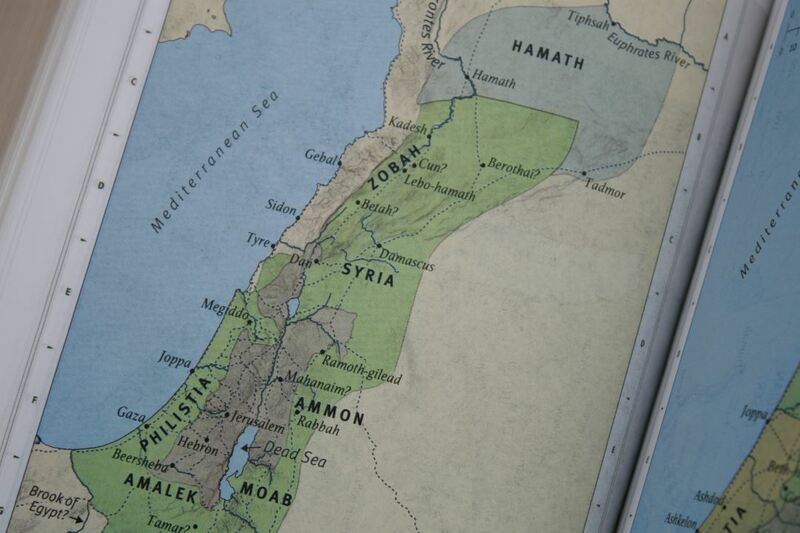 Highlights for tables, charts, and chapter numbers, are tannish-green earth-tones. I like the earth-tone look and feel. Cross-references are keyed to the text with letters. Translation notes are keyed to the text with numbers. It mostly looks line-matched so the lines on both sides of the page are printed on the same line, but there are lots of pages that don’t have it. I find these pages harder to read. The pagination is exactly the same as the regular edition. There are 80,000 cross-references. This is easily enough for most study and sermon prep. 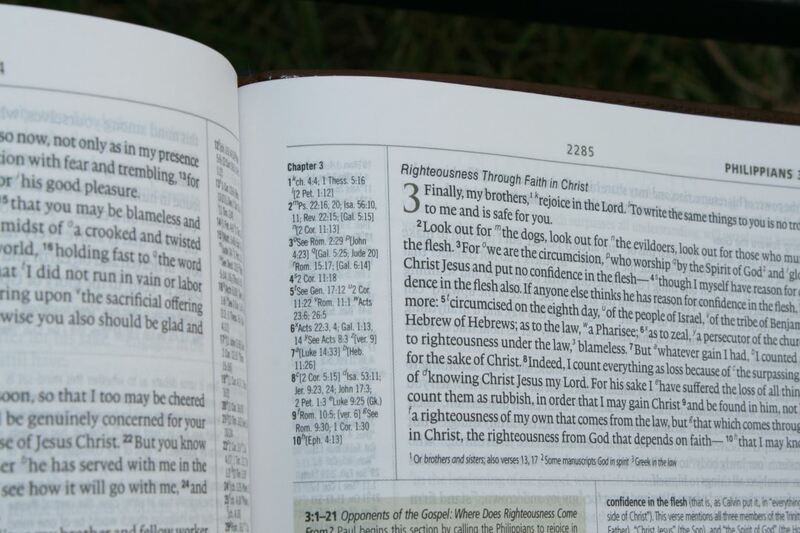 Cross-references are placed in the inner margin and are keyed to the text with numbers in bold. The top of the column shows the chapter number in bold. 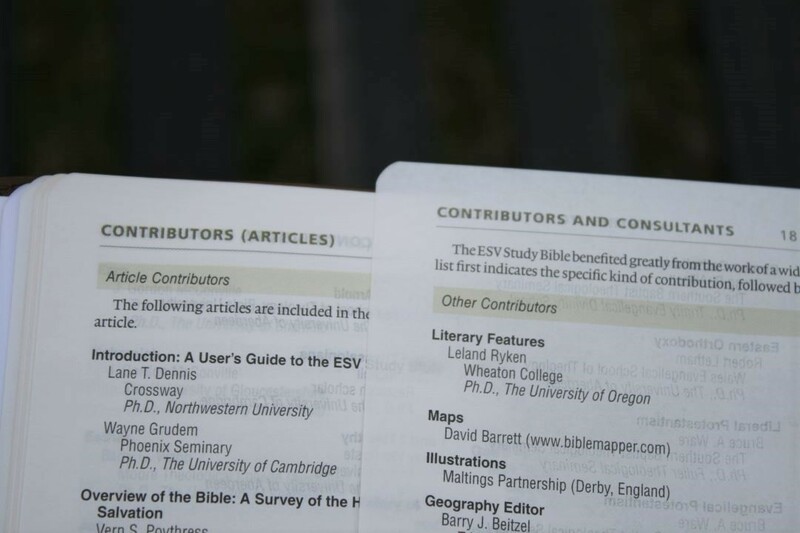 The standard ESV translation footnotes are placed under the text. 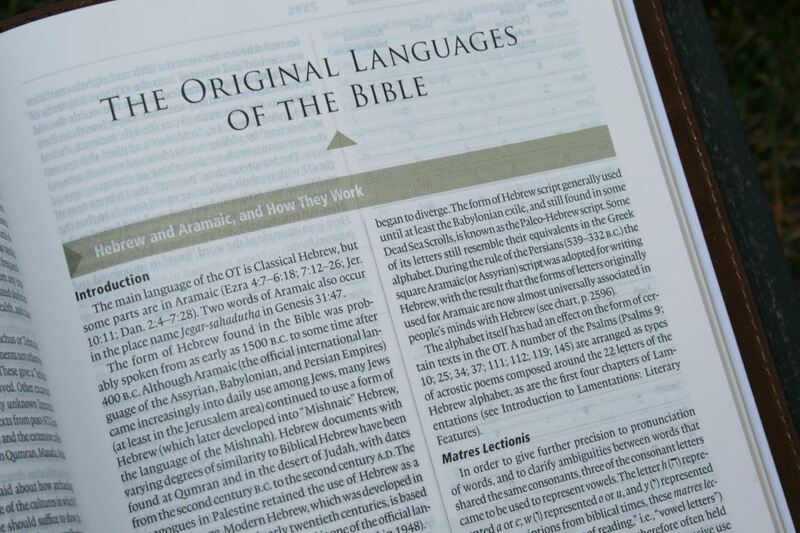 Footnotes include explanations of the text, meanings of words, manuscript variations, meanings of names, Hebrew and Greek definitions, alternate renderings, weights and measures, etc. 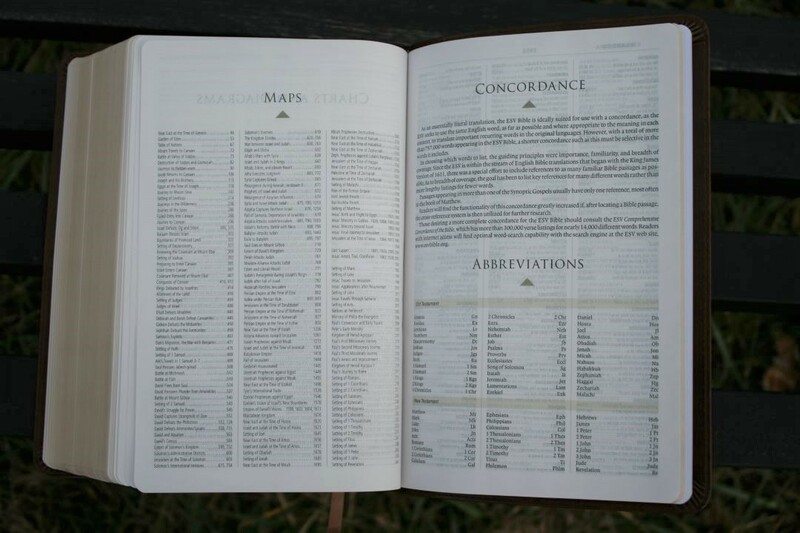 These are the basic notes that are placed in most ESV Bibles and are helpful for shedding light on the translation itself. 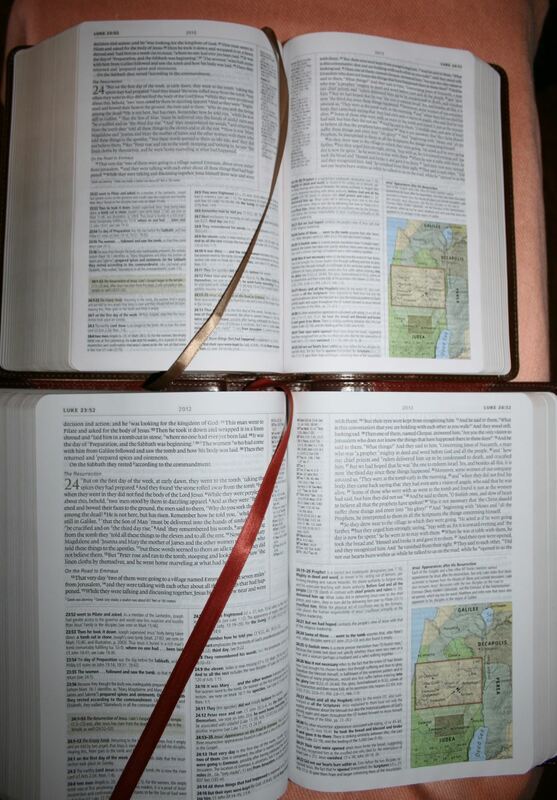 Each major section (such as Prophetic Books, each of the Testaments, between the Testaments, etc.) has an introduction that talks about key people, themes, scholarly issues, pronouns used, timelines, reading tips, etc. 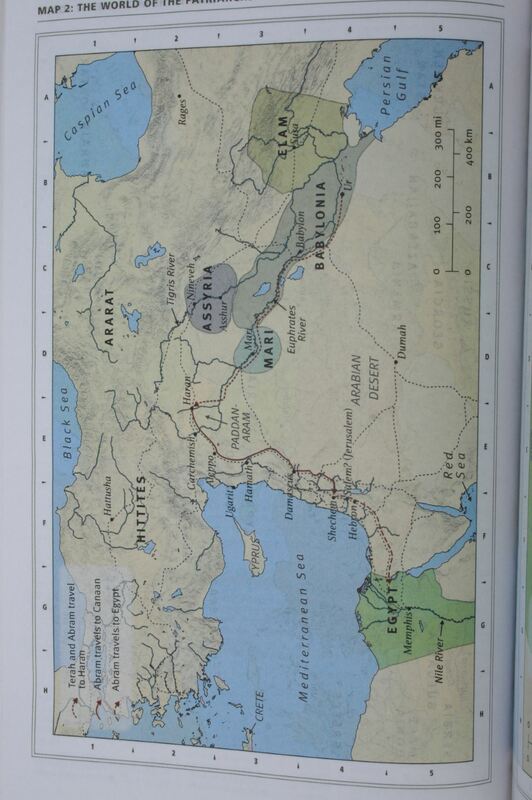 They also show a chart of the books within that section. The book introductions are detailed and average around 5-6 pages for most books. 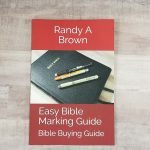 They discuss the author and title, date and location, theme, purpose, occasion, and background, key themes, history of salvation summary, timeline, and provide a detailed outline. 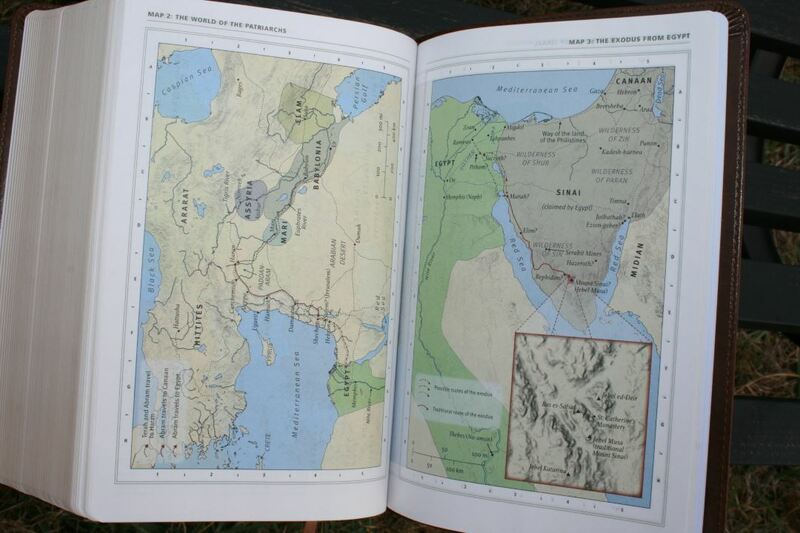 Some books have maps that show where the events of the book took place. 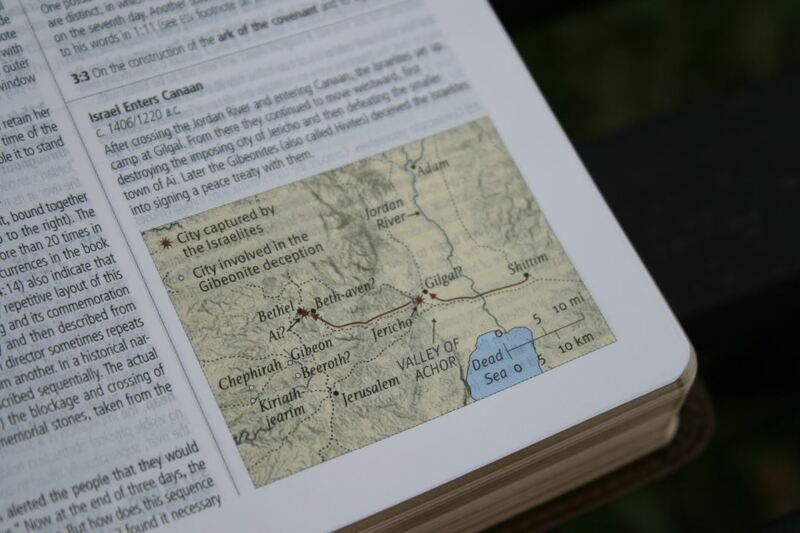 Some include a section that covers a key event in that book. 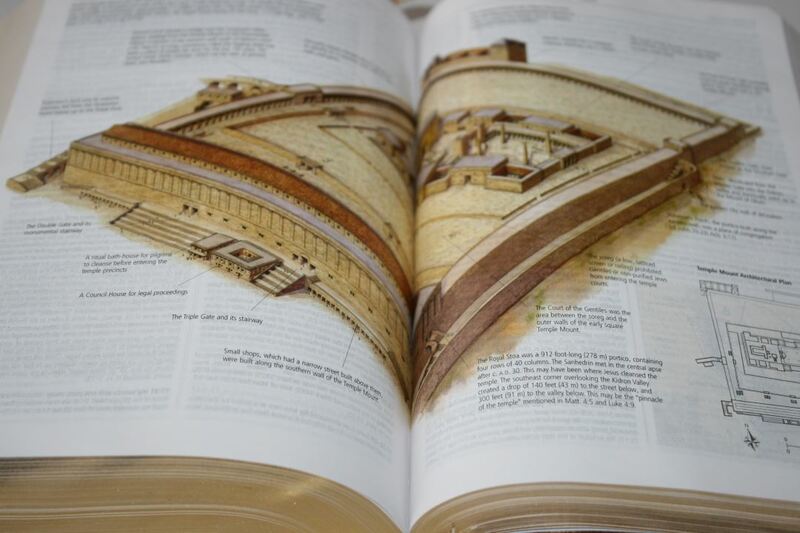 There are 20,000 notes that include commentary, maps, charts, Hebrew and Greek definitions and explanations, references to similar passages or passages that explain or expand on the note, etc. They are extensive, averaging about half the page. 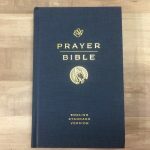 Although they do have a theological bias (as should be expected with any study Bible), many of the notes give more than one point of view. 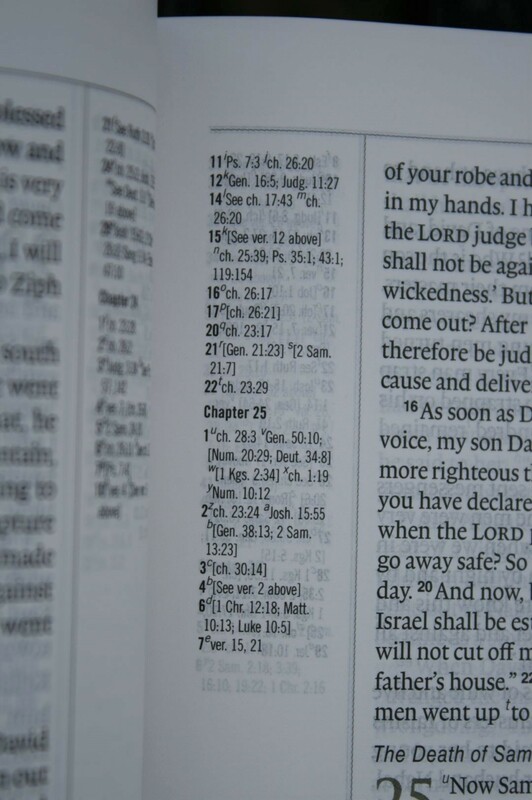 The notes show the verse number they correspond to in bold. Some have titles that are highlighted and in italics. 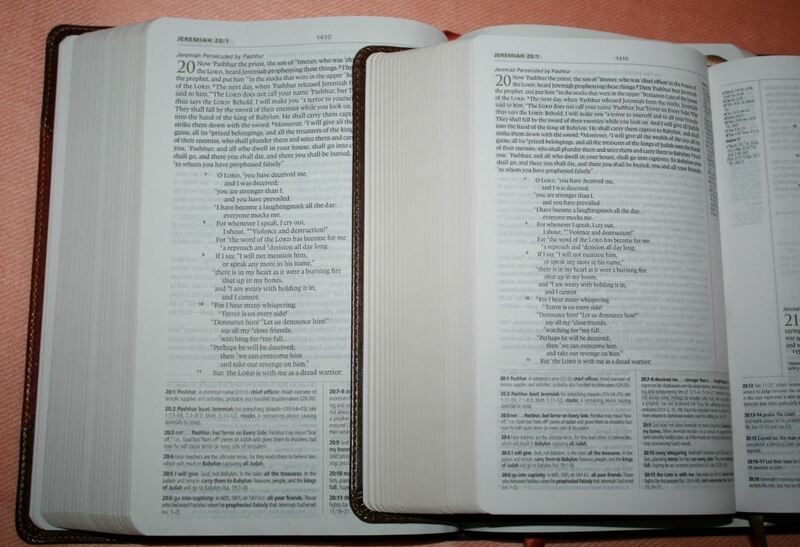 These apply to large passages that span several verses. 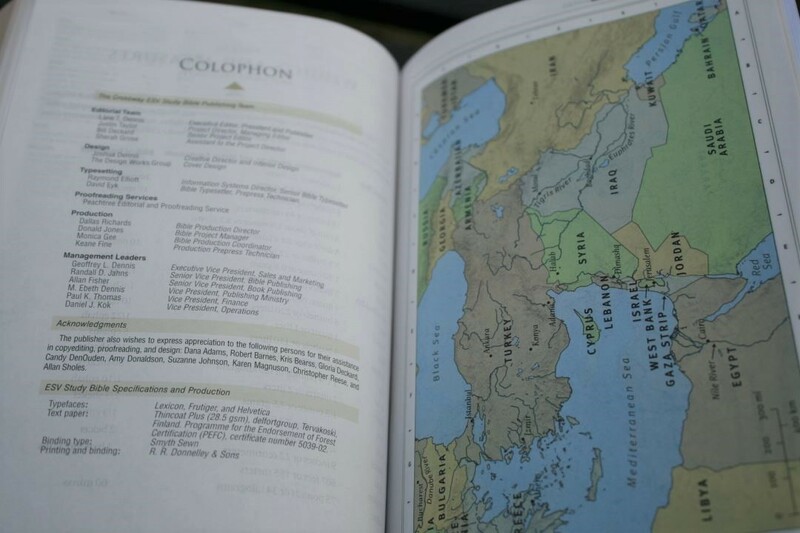 The maps within the notes are darker and have bolder colors than those in my regular edition. There are also several illustrations throughout the text. This one takes two full pages. 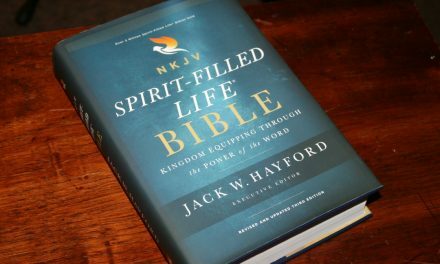 Like any study Bible with commentary, I recommend that you do your own study and not just rely on the notes in the Bible. The study notes are great as a guide or for a second opinion. 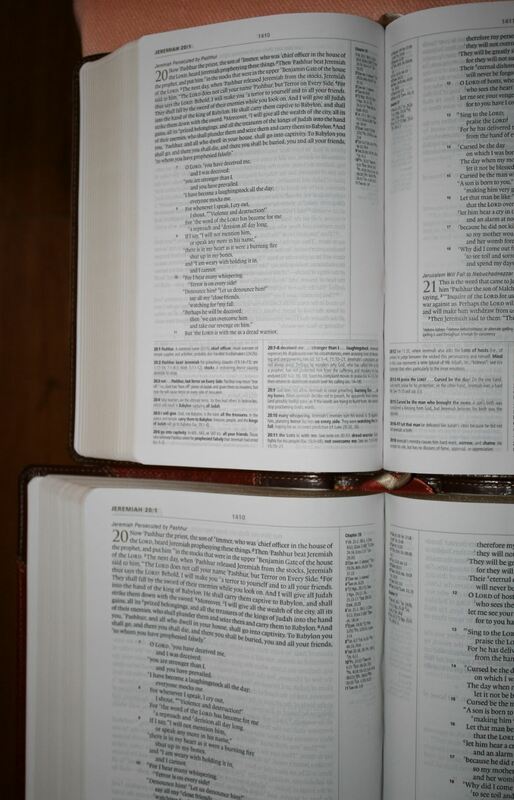 This Bible has lots of articles that cover major topics with most having multiple subtopics. 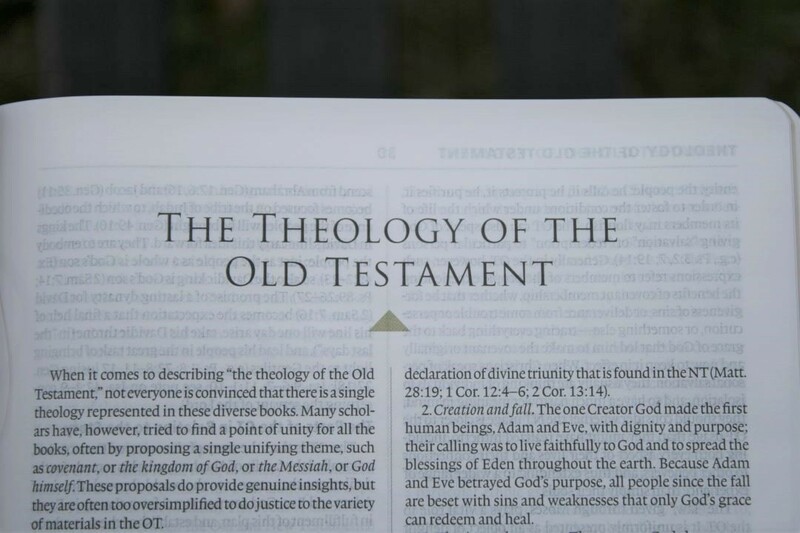 Some are doctrinally based while others cover topics such as studying the Bible, biblical manuscripts, the original languages, reading the Bible, interpretation, the canon of Scripture, Biblical archaeology, etc. I had heard that the personal size edition had removed some of the articles but this one has all of the articles my regular edition has. 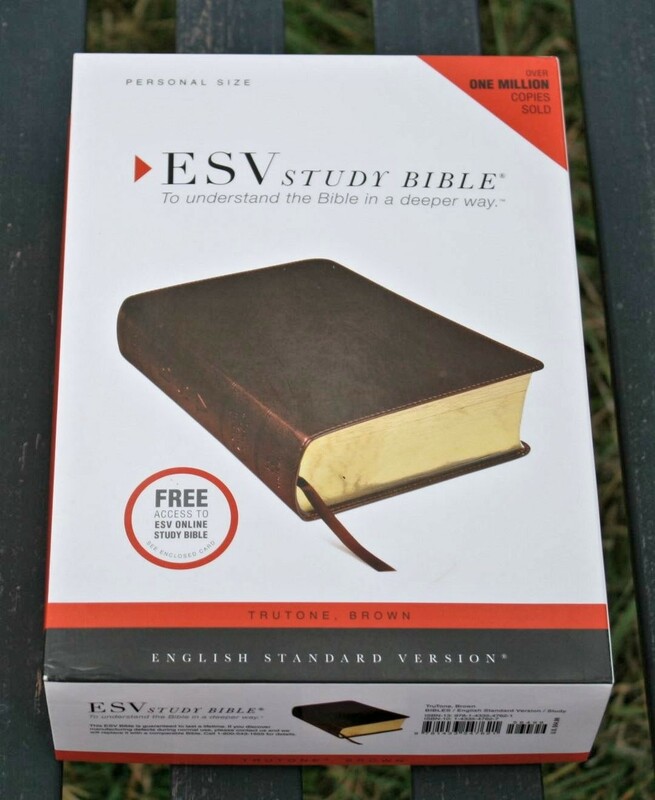 This Bible includes a card with an access code for free access to the ESV Online Study Bible. The online edition has everything that is found in the print version plus a few extras. 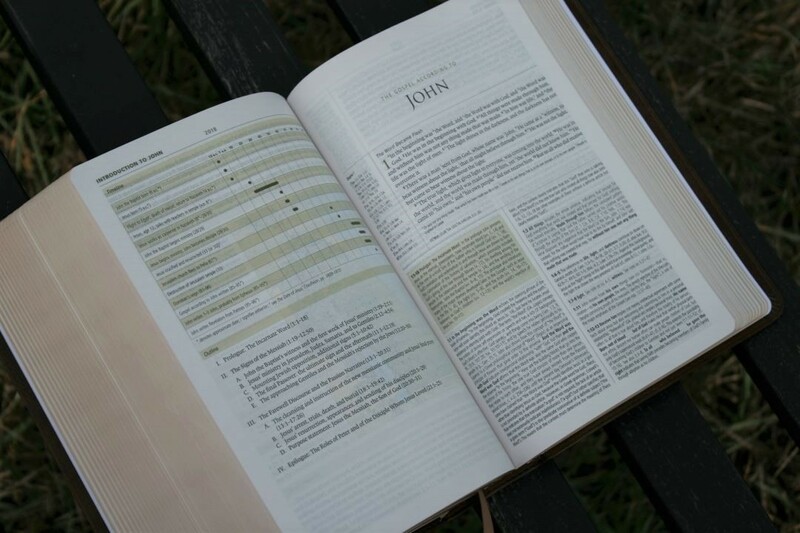 You can create your own notes, search, follow links, and listen to the ESV Bible in audio. 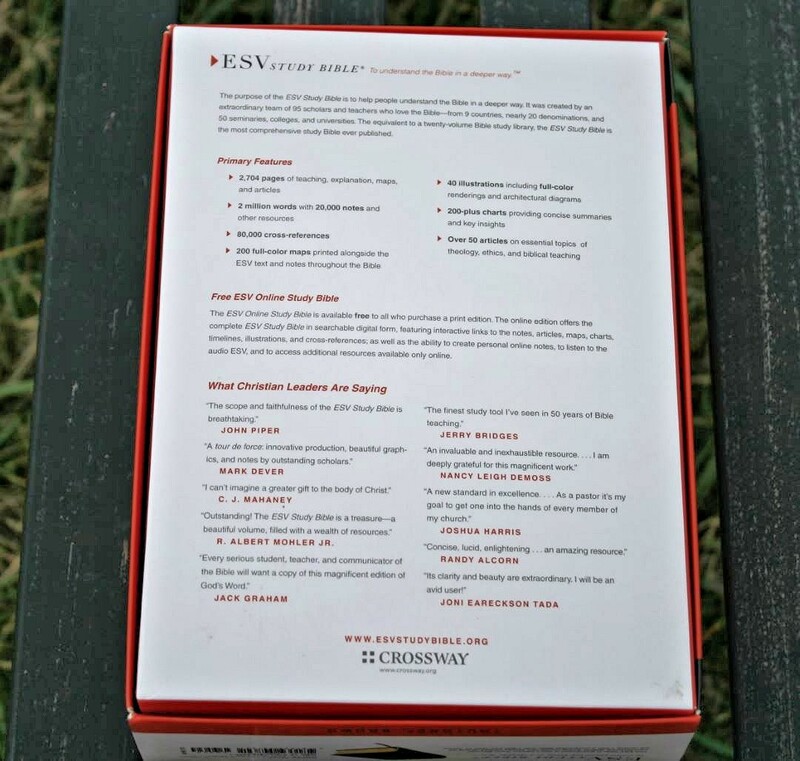 Even in a personal size edition, the ESV Study Bible contains so much study material that it’s a large study library. 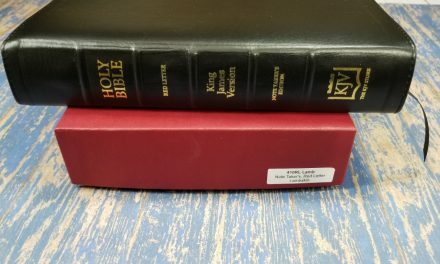 It’s still a thick Bible but the smaller size is much easier to handle. The thinner paper isn’t as opaque as its bigger brother, but it’s still highly opaque and remains readable. The font is small but it doesn’t seem tiny. I like the personal size edition so much that I use it instead of the regular edition. 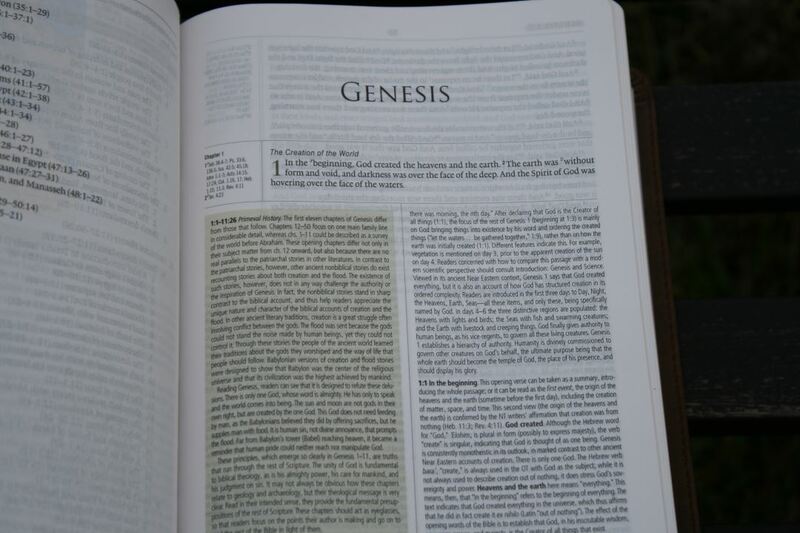 The quality of the notes and articles makes it a great study tool for teachers, preachers, and students of God’s Word. The personal size makes it a handy edition for reading and study. 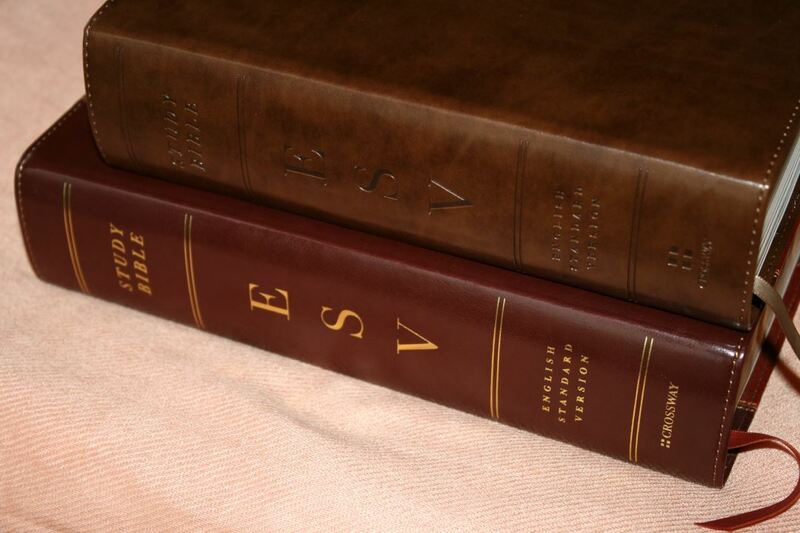 I highly recommend the ESV Study Bible Personal Size. Thanks for the great review. I just bought this exact model after reading this. That’s great Preston! Please let us know how you like it.